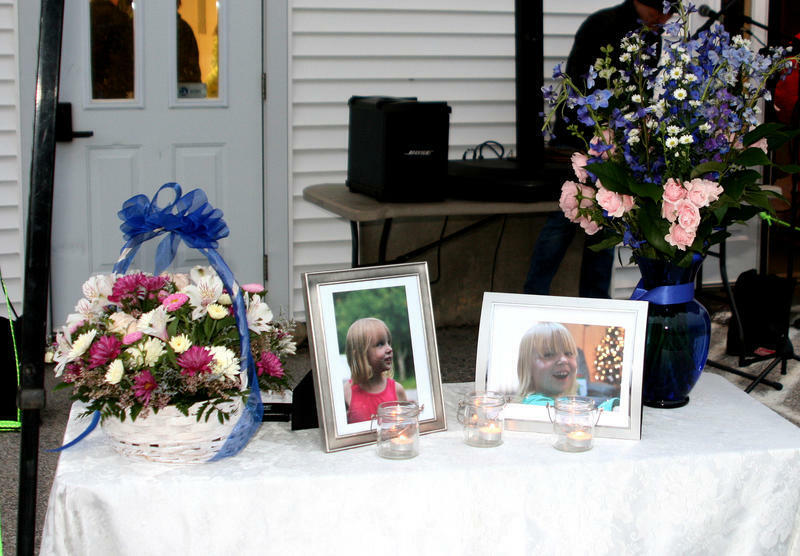 Photos of 10-year-old Marissa Kennedy are displayed on a table at a vigil in Stockton Springs March 4, 2018..
GRATZ: Steve, first of all, what is prompting the call for this additional investigation? MISTLER: Well there are a couple of factors. One is that lawmakers called for an investigation into whether or not the system fell down in its response to what neighbors and school officials say were numerous complaints or reports to DHHS about abuse allegations leading up to her death. Sen. [Michael] Thibodeau [Republican from Winterport] has asked for the administration to do an investigation. And Gov. Paul LaPage has said, through a statement, that that investigation is already underway. Patricia Hymanson [Democratic state lawmaker from York] is asking for something a little bit different: She's asking for the Government Oversight Committee to basically authorize the Office of Program Evaluation and Government Accountability - otherwise known as OPEGA - to take a deeper look at this. GRATZ: All right. Is there anyone else besides OPEGA who would take part in this kind of investigation? MISTLER: Aside from whatever internal audit that the DHHS agency undertakes, OPEGA is, effectively, the watchdog arm of the Legislature, and the Government Oversight Committee is the sole authority to authorize OPEGA to do an inquiry into any agency, or any other quasi-governmental agency. And they have done this in the past. If you recall, they authorized a pretty high-profile review of the Maine Turnpike Authority back in 2010, 2011. In this case, they would be evaluating whether DHHS has followed the appropriate procedures in responding to child welfare abuse allegations or reports. There's a childcare ombudsman who has told us that she's recommended since 2013 that DHHS improve its procedures. GRATZ: What would this investigation look like? Would OPEGA hold hearings? Will this be in public or largely behind closed doors? MISTLER: We would have a general idea what they'd be looking for, because that would be in the public motion for them to investigate what OPEGA has done with its work. That report becomes public, and that's when public hearings would take place. And then potentially, if there's anything troubling in there, the GOC [Government Oversight Committee] could recommend legislation to fix whatever problems that were found, if any. GRATZ: So what factors do you think will play into the Government Oversight Committee's decision as to whether to order this investigation? MISTLER: You know, this is such a high-profile case and a really disturbing one. It doesn't seem to be particularly partisan. In this case I think there is agreement among Democrats and Republicans to get to the bottom of this, and to find out whether there needs to be improvements in the program that oversees Child Protective Services. Nobody wants kids to continue to be in situations where they're getting hurt. But there is some politics involved here, and I don't know if that it will creep into their decision on Friday on whether or not to authorize an investigation. I mean, this agency is overseen by the governor's appointees: his commissioner, which is former Commissioner Mary Mayhew, and now his new designee, Ricker Hamilton. You know, if there's any negativity that would perhaps shine on the administration out of this, that might persuade some to either limit the scope of the investigation or maybe to discourage it from happening altogether. But we have received no indication that that's the case. And I think in the past this committee has actually shown itself to be relatively non-partisan. GRATZ: And we should point out Mary Mayhew is one of the many people running for governor this year. Steve, thank you very much for your time, appreciate it. MISTLER: Happy to do it. The Maine Department of Health and Human Services (DHHS) Commissioner Ricker Hamilton says he welcomes an outside review of the way the agency handles child abuse complaints. Hamilton says the agency is already taking steps to rectify problems identified by the children’s welfare ombudsman, who has determined that the department’s assessment process has too often failed to move swiftly enough to protect children.